I'm Playing Assassin's Creed IV Right Now. On My Desk. With Toys. While the rest of the world has to wait until the end of this month to get their hands on Assassin's Creed IV: Black Flag, I've got Edward Kenway and friends right here on my desk, ready to pillage, loot, burn, and maybe make-out a little. With three generations of Kenways — Edward, Hatham and Connor — already on store shelves, McFarlane Toys is gearing up to release a second wave of Assassin's Creed figures on the market, covering the tail end and downloadable content of Assassin's Creed III and a trio of Assassin's Creed IV: Black Flag characters not in any way related to the Kenway family. I've got them all right here. Want to see them? Along with the eight single figures, McFarlane is also releasing a three-pack called the Golden Age of Piracy, or as I like to call it, the Supporting Cast Pack. It contains Blackbeard, Black Bart, and Decidedly Not-Black Benjamin Hornigold. McFarlane Toys has made a name for itself — well, a name other than Todd McFarlane — as a maker of highly-detailed figures. They might not be wildly articulated, but they certainly capture the spirit of the subject they represent. Here's a behind-the-scenes look at the work that went into creating just the Edward Kenway figure from the line. The results are quite detailed and intricate. Some of the textures on these figures are mind-blowing at their scale. Blackbeard's coat in particular feels like tiny bits of leather expertly stitched together. If there's a major failing of this and other McFarlane toy lines, its that the folks painting the figures often can't keep up with the fine detail. Of the eight figures I played with, only one — white-coated Connor — had any serious painting flaws, as you'll see in the video below. Of the Assassin's Creed III figures, my favorite is the hardest to spell. We'll call him alt-Connor or Anthony Kiedis instead of trying. Kiedis is followed closely by Hatham. I hated playing Hatham in the game, but there's just something about the expression of his action figure than makes me feel for the guy. I get the feeling that his father never loved him. 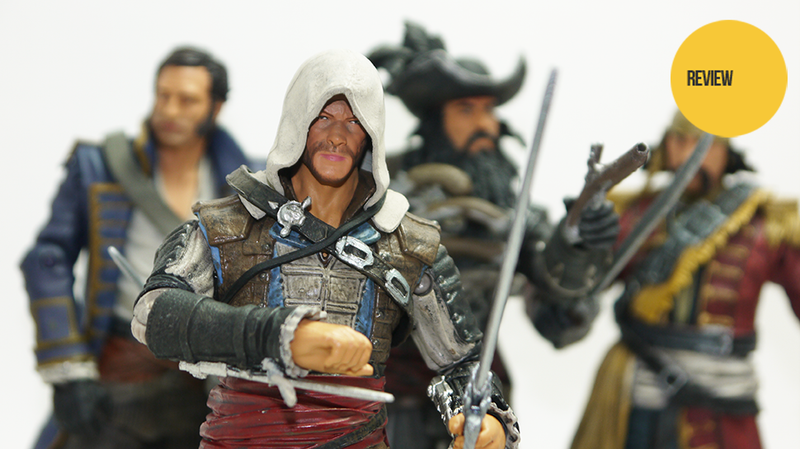 While the Assassin's Creed III line is a complete Connor-fest, McFarlane has a full cast of characters line-up for Assassin's Creed IV: Black Flag. I love the expression on Edward's face, and I will never get tired of saying the name Hornigold, but it's the Brothers Black — Black Bart and Blackbeard — that steal the show. They've got removable hats. Removable hats. All in all, McFarlane Toys' line of Assassin's Creed figures are a lovely compliment to Ubisoft's game franchise, capturing the look and feel of salty dogs and regular land-based dogs alike. And since each comes packed with a code for special costumes or sails in Assassin's Creed IV: Black Flag, dedicated fans will buy them no matter what I say. Once they're all available, you'll be able to get them here.